IN an unusual move, the Securities Commission, Malaysia’s capital markets regulator, has taken civil action against the promoters of an alleged investment scam over the Internet that could have bilked Malaysian and other investors by as much as RM285.5 million (S$126.7 million). Sweden Fund is the latest scam in town. It is modelled after Swiss Cash which I have mentioned before. It is so ridiculous that I wouldn’t even bother to explain why it is a scam. Their performance will put Warren Buffett to shame. Yesterday, I received a name card from a person (details have been removed to protect the privacy). Apparently, he is promoting some investment products from a company called swisscash. This is a company that promises an average investment return of 20% per calender month and 300% returns in 450 days. Warren Buffett would have been put to shame. What I cannot understand is that how come even a person who is working as a stock broker can fall for such a thing. Would you want to invest in a company registered in the Dominica Republic with a PO Box as the company address? Other than that, anything that promises you 20% returns/month guaranteed is definitely a scam. Many of them have come and gone, with different names but similar modus operandi. Last Updated by Registrar: REGISTERFLY.COM, INC.
KUALA LUMPUR, Aug 30 (Bernama) — Malaysians are advised not to invest in an investment fund under the name of Swiss Cash or Swiss Mutual Fund (1948) being offered through the Internet and local agents. The Swiss Embassy here said in a statement today that the investment fund had no relation whatsoever with the country. “The company operates outside Switzerland and is not subject to the very stringent Swiss banking laws,” the embassy said. 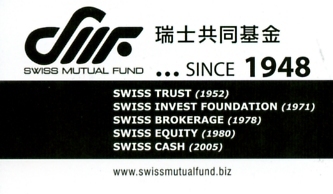 “The reference to Switzerland with the attribute Swiss is solely made with the purpose to attract the unaware public to invest, thinking that they would be protected by Swiss laws,” it added. The Swiss Embassy does not recommend the investment fund and advised the public to be very cautious before investing in the fund. 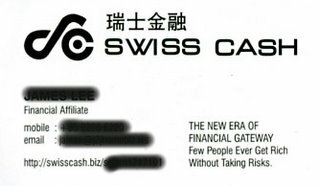 In my previous post, I mentioned about one form of ponzi scams. These also fall into the category of High Yield Investment Programs (HYIP). You can do a search for “HYIP” on the internet and find many such programs. Again, a word of caution here. Anything that promises you anything close to 10% daily returns (or even less) is simply not sustainable in the long run. At a rate of 10% daily returns, $1 will compound into $17.44 after 1 month; $34 million after half a year and $1283305 billion after a year! Such a return will put even the second richest man in the world Warren Buffett to shame. Do not let greed overcome you! A few hours ago, I had a friend asking me to evaluate an ‘investment’ opportunity. Apparently, you get paid just for surfing the internet. Well, this concept is not new and I had personally earned a rate of about $0.50 per hr doing it in the past. The money comes from advertisers but such programs usually fail in the end because such a form of advertising is NOT effective and most advertisers eventually drop out. The red flag in this opportunity that my friend bought up is that the company, 12dailypro, requires you to put in an ‘investment’ to earn from the surfing. And you can earn 12% per day from it! Such a high rate of return automatically activates the ‘scam’ trigger in me. Shortly after, I was reading through an investment forum and some people acutally commented that they were willing to put in some money to try out the concept. I was sad (and amazed) that people can actually fall for such scams. Nevertheless, I felt duty bound to warn as many people as possible. First, you would want to read this tutorial on the different kinds of scams available. This second tutorial elaborates on pyramid schemes and ponzi scams. And lastly, this comprehensive article has a good analysis of “surf and get paid” programs and explains why programs like 12dailypro and studiotraffic are pyramids in disguise. If you have experience in any of such scams, feel free to share with us your comments. And if you know of people putting their hard earned money in such schemes, please warn them before they lose all their money!